My great grandmother, Frances Adelaide McAlpin, was the only daughter of the ten children of David Hunter McAlpin (1816-1901) and his first wife Frances Adelaide Rose (1829-1870). Several of her brothers died young; the ones who survived did well for themselves. Her next younger brother was named David Hunter McAlpin, Jr. (after his father, and an older brother who died as a toddler in 1853). He was born June 2, 1862, in New York City. 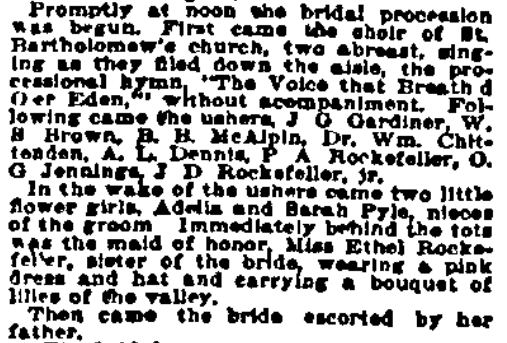 Searching for Emma Rockefeller in December 1895 in any newspaper database will bring up dozens of reports from all around the U.S. of this grand wedding. In Rockefeller Family Most Brilliant of All. 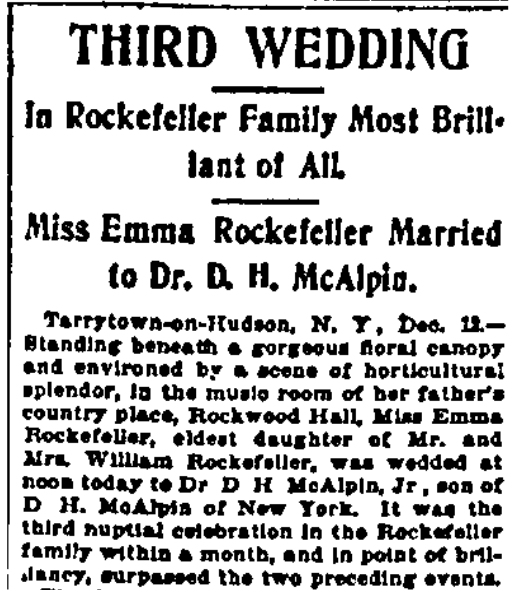 Miss Emma Rockefeller Married to Dr. D. H. McAlpin. Tarrytown-on-Hudson, N.Y., Dec. 12 - Standing beneath a gorgeous floral canopy and environed by a scene of horticultural splendor, in the music room of her father's country place, Rockwood Hall, Miss Emma Rockefeller, eldest daughter of Mr. and Mrs. William Rockefeller, was wedded at noon today to Dr. D. H. McAlpin, Jr., son of D. H. McAlpin of New York. It was the third nuptial celebration in the Rockefeller family within a month, and in point of brilliancy, surpassed the two preceding events. Next is a detailed description of the decorations, including the flowers, the colors and the musicians, which I don't include here. Promptly at noon the bridal procession was begun. First came the choir of St. Bartholomew's church, two abreast, singing as they filed down the aisle, the processional human "The Voice that Breathd Oer Eden," without accompaniment. Following came the ushers, J. G. Gardiner, W. S. Brown, B. B. McAlpin, Dr. Wm. Chittenden, A. L. Dennis, P. A. Rockefeller, O. G. Jennings, J. D. Rockefeller, Jr. In the wake of the ushers came two little flower girls, Adelia and Sarah Pyle, nieces of the groom. Immediately behind the tots was the maid of honor, Miss Ethel Rockefeller, sister of the bride, wearing a pink dress and hat and carrying a bouquet of lilies of the valley. Then came the bride escorted by her father. Then comes a two paragraph detailed description of the bride's dress and mention of the groom standing at the canopy with his brother, C. W. McAlpin, who served as his best man. (Charles Williston McAlpin was the next youngest brother.) The ceremony was performed by Rev Dr. Ermitage of St. Bartholomew's, and assisted by Rev. Dr. Harris of Yonkers. A bouffet breakfast was served in the main dining rom, over 400 people participating. Miss Emma Rockefeller is about 24 years old [she was actually 27 1/2], highly accomplished and considered one of America's greatest heiresses. Dr. McAlpin is 33 years old, a son of D. H. McAlpin, the millionaire tobacco manufacturer. He is a practicing physician of New York city, and an '86 Princeton graduate. The young couple received hundreds of beautiful and costly presents. Thanks for another great post Elizabeth. Sorry I haven't written much but I do follow your posts regularly. I'm glad you enjoyed the post. Thanks for continuing to follow my blog and for your comment. The wedding sounds very impressive. I like how newspapers back then provided detailed descriptions. It would be really interesting to know how close your grandfather was to his cousins. He might have had some really interesting stories about the Rockefeller connection. Sheryl, I love finding relatives in old newspapers, especially because these articles are so descriptive. This grandfather of mine was estranged from his only son (my dad), and died when I was a toddler, so I never heard much about him at all.